A clear sky. Low near 45F. Winds light and variable..
A clear sky. Low near 45F. Winds light and variable. “Found” by Jeff Newmann, begins on the end pages. A preview of what’s to come shown in an illustration of a despondent child gazing out a window running with rain. Her sadness is obvious as is the despair of a soggy dog on the next page, trudging through a puddle on a trash-strewn street. A rescue is about to take place. Once the little girl has the wet dog in her arms, into her room they go where a framed photo of Prudence, the girl’s former dog, sits on her nightstand. A lost-dog poster across the room details Prudence’s fate. The girl readies herself for bed, the golden-haired pup on the floor. Soon the “found” dog makes its way into the girl’s bed and her heart. In the days that follow, a deep affection between them blossoms, but like a frayed leash, the bond becomes tenuous when the girl takes her pup to the pet shop and sees a lost dog poster with a photo that looks like her new dog. She should do the right thing, but how can she? Sweet, simple illustrations by Larry Day and a moral to the story make “Found” a 10-bark read. Bonnie is now the proud mother of three bouncing, energetic puppies, and Madeline is eager to pick one out to take home. But she’s stumped — which pup to choose? Madeline gets wise advice from Mrs. Dimple, “Why don’t you see if someone picks you,” she asks. So Madeline does. She thinks up a name she likes, Star, which she voices, and rumble, tumble, a ball of downy love climbs into her lap. The experience spawns a story about how Mrs. Dimple adopted Bonnie from a shelter. Curious about the goings-on in a shelter, Madeline tours a nearby facility, and is shocked to see some of the animals so sad. She wants to do something and devises a plan to entertain them. With gorgeous pastel illustrations readers are treated to a star-studded story that drives home the role reading and love play in making dogs, and people happy. An animal shelter proves to be a place of peace for Fiona and Finn O’Brien, who weather an unexpected tragedy involving their father, Deelan O’Brien. “My Father’s Words,” by Patricia MacLachlan, tells the siblings’ story, detailing how they manage to make sense of the change in their lives and adjust to not having their dad around — the maker of runny eggs, the singer of songs on the basketball court — a psychologist who spouted wisdom and urged them to “ . . . Be thoughtful. Be Smart . . . Be kind,” and modeled those mantras. To help cope with the uncontrollable situation they find themselves in, the siblings’ friend and neighbor Luke, who’s like family, suggests it might help them to volunteer at a nearby animal shelter, where they also board dogs. Four days a week, the three do just that and before long Finn makes a connection with a dog whose owner has recently died. 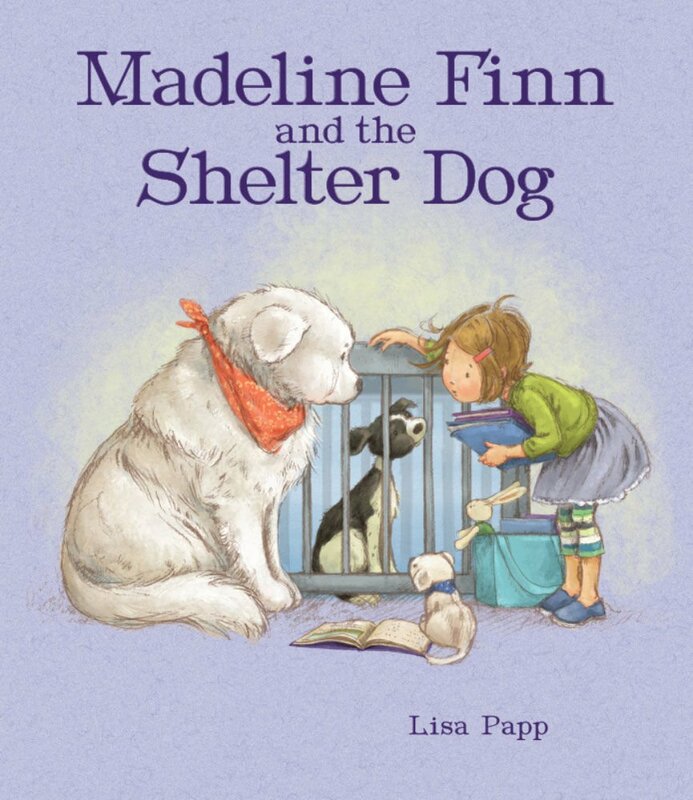 The pup is depressed and won’t even acknowledge visitors but with tender care Finn works his magic and in the process gets back more than he gives, as do Fiona and Luke in this simple spare book that packs a big dose of sentiment with its admirable characters.